Bhola Homes is a residential project developed by Bhola Infratech. 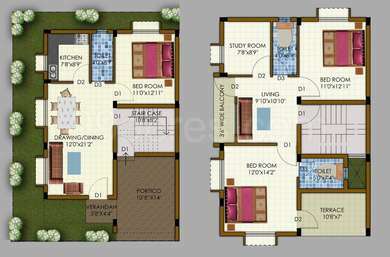 The project offers very well designed 3BHK, 4BHK and 5BHK villas. The project is well connected by various modes of transportation. The site is in close proximity to various civic utilities. Where is Bhola Homes located? The project is located in Patia, Bhubaneswar. Does Bhola Homes have swimming pool? The project doesn't have a swimming pool. Does Bhola Homes have gym? Yes the project has a gym. Is Bhola Homes approved from banks? HDFC home loans, ICICI and 3 more have approved the project. Home loans can be availed for this projects from these banks. Concrete frame and 1st class brick wall with intermediate tie beams levels i.e. plinth, lintel and roof beam. All external walls finishing with motif plaster weather coat painting and contrast color scheme. Decorative marble Kota finish in pattern on all steps staircase verandah with stainless steel pipe hand rail and baluster. Stainless steel sink for kitchen with granite slab cladding over platform. MCCB and powder coated box type distribution board with all ISI marked decorative point and outlet. Internal telephone and cable wiring are standard feature.